The 3 Day Hop-On Hop-Off Pass includes unlimited Hop On Hop Off access on The Official City Tour, Sausalito Tour, Park and Beach Tour and the San Francisco Night Tour for 72 hours! 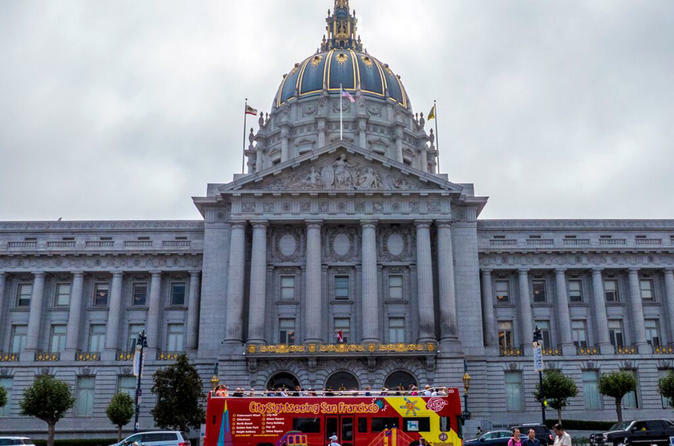 You can hop-on and hop-off the bus at any of the designated City Sightseeing stops to explore San Francisco on your own pace. The Official City tour provides the best views of San Francisco's Fisherman’s Wharf, Downtown and Financial District, Union Square, The Golden Gate Bridge and Golden Gate Park, Haight Ashbury, Chinatown and much more from a Double Decker Bus. Be sure to bring your camera, there will be plenty of photo opportunities to commemorate your visit to the city by the bay. Enjoy the ride accross world famous Golden Gate Bridge and the picturesque coastal town of Sausalito, where you are free to eat, shop, enjoy the views and visit some of the many galleries. Catch a bus later in the day to go back to San Francisco. in the world to the San Francisco Zoo and to stunning Ocean Beach. If you are looking for spectacular views of San Francisco, this San Francisco Night Tour will be one you do not want to miss. This fully Narrated tour will take you through some of the most memorable areas from our Downtown tour with the added attraction of the onset of the evening and sparkle of the City. Although this tour is not a hop-on hop-off, there will be plenty of photo opportunities that are not to be missed.